Heaton Park is a very special place to me. When my husband and I found out that I was pregnant with our eldest over six years ago now, one of the first things we did was visit this lovely open space that is actually one of the largest Municipal Park's in Europe. We took a picnic and sat on a grassy hill smiling secretly to each other as we watched children laughing and playing around us, imagining what the tiny little bean inside my tummy would grow up to look like, daydreaming of future picnics there as a family. 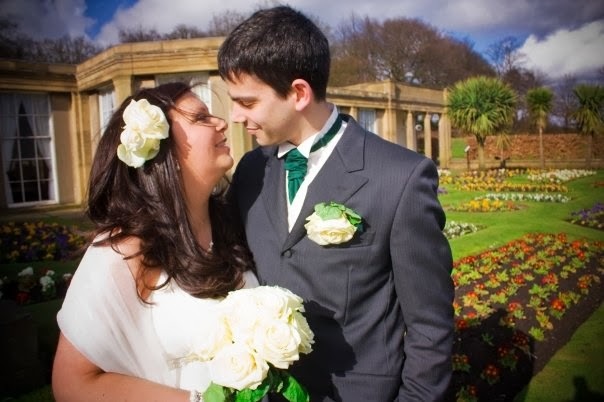 Just over two years later we chose Heaton Hall in the centre of the park as the place where we would celebrate our wedding surrounded by family and friends. 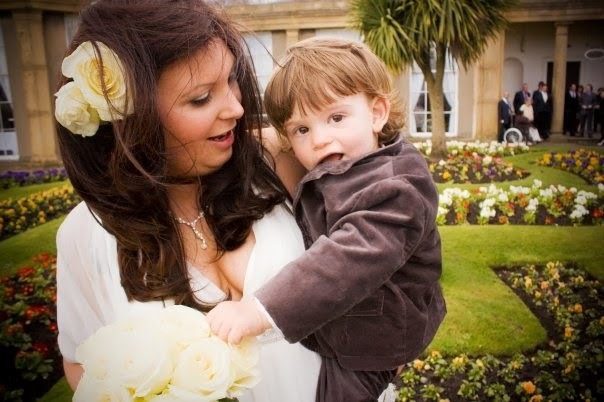 Our wedding wouldn't have been possible without all the help and support from our loved ones, one of these lovely people was my mum's best friend, she had been a part of my life as long a I remember, our families holidayed together in the lakes and she was part of many fun filled days out in my childhood. All this while she was battling with breast cancer for the second time. Less than six months into our marriage she sadly lost her battle with this dreaded disease. 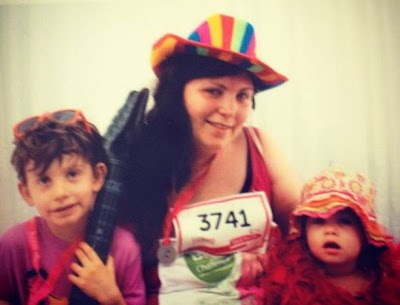 When the lovely Pippa from Red Rose Mummy told me that Scottish Power were looking for local bloggers to take part in Race For Life for Cancer Research UK at none other than Heaton Park, I knew I had to do it. How could I not? From the mouths of babes, eh? What more can I say? donate here and help us help Cancer Research. The day itself was full of emotion and memories, during the Race we walked right passed the Hall, passed the place where we had stood four and a half years ago on my wedding day to have pictures taken surrounded by those that we hold close, I find it so sad that this beautiful old building no longer holds family celebrations and is instead now closed to the public. The bright and fragrant flowers that featured in my wedding photographs are now replaced by overgrown weeds and unkempt grass. I paused for a moment to remember one person in particular from that day. We also passed the hill where my husband and I had sat with our dreams and ambitions and I looked down at my tired and sweaty five year old who was in the middle of telling me a story about a very special hero called Fireman Ben, and I was so incredibly proud. My husband, daughter and mum came to support us and as my mum came over to hug me at the finish line I could see her cheeks were wet with tears, It had brought back memories for her too. Cancer, We're Coming To Get You! As well as being emotional it was also a really upbeat day. This was about fighting Cancer and about winning! There was music, there was fancy dress and there were smiles. I met up with some other lovely bloggers at the Scottish Power High 5 challenge tent where there was lots going on for the whole family, from doing the Cancer Slam Dance on video, decorating a special pink High 5 Glove and jumping up for a High five, or posting a personal message on the High Five Memory wall. Scottish Power have set themseles a target of 50,000 high 5's and if they meet this target they will be donating a fabulous £25,000 to Cancer Research UK. 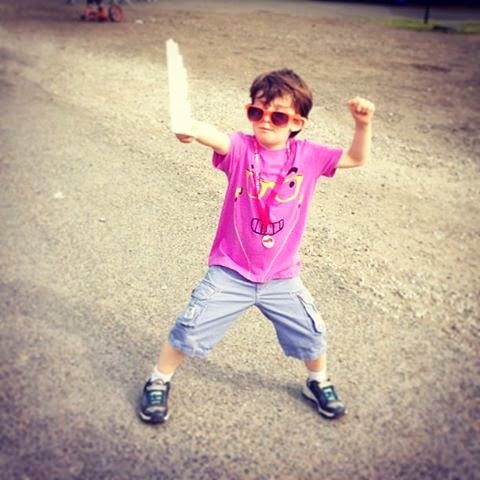 You can join in with the High 5 Challenge and help them reach this amazing goal! Find out more over on the High 5 Challenge Facebook Page. 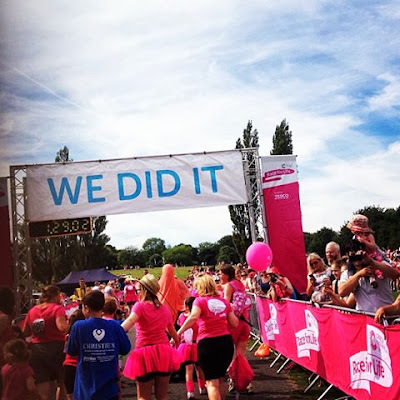 So that was my Race For Life Heaton Park journey, have you taken part in Race for Life? You can also read about the Barnardo's Big Toddle that we took part in also in Heaton Park. 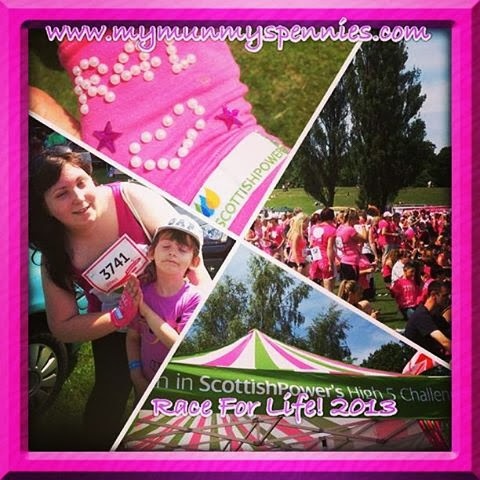 Scottish Power kindly covered the cost of my entry and donated to my sponsorship. Oh this brought a tear to my eyes well done you, let's all join you indeed CANCER YOU HAD BEST WATCH OUT!!! Well done to you and Ben, and how lovely to do it in a place that is so special to you. Beautiful post. what an emotional post for so many reasons. I did think that it was such a waste when I walked past the Hall. There were two women walking just behind me, reminiscing about how the Hall used to be so vibrant and she used to jog round on a half hour route to keep fit before her children came along. She was about 60 years old. Lovely post with such a mixture of emotions, well done for doing it and I am so impressed with your son for getting involved, you must be so proud ! I finally got around to reading this post and I'm glad I did. I didn't realise the Hall had closed now, that's so sad. I felt very emotional during our race for life too, the messages I read on everyone's backs show how important it is for people to stand up to cancer.